Pieter Cornelis (Piet) Mondrian (b. Amersfoort, Netherlands, 1872 — d. New York City, 1944) Dutch painter. 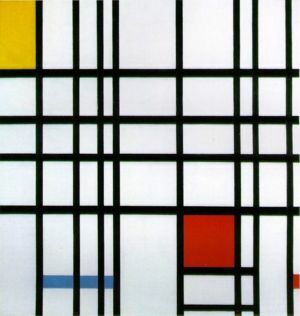 He was an artist of the DeStijl movement. His work is characterized by severe geometry and a very limited color scheme. One of Mondrian's better known works is "Composition with Yellow, Blue, and Red". This page was last modified on 18 January 2017, at 16:52.